Opie the Plush Oviraptor Dinosaur Stage Puppet by Aurora is a crazy cool and insanely fun plush puppet. ÊThe 10 inch size of this plush oviraptor puppet makes it workable for hands of all ages and its soft faux fur makes it lovable and cuddly even when it isn't part of an awesome puppet show. 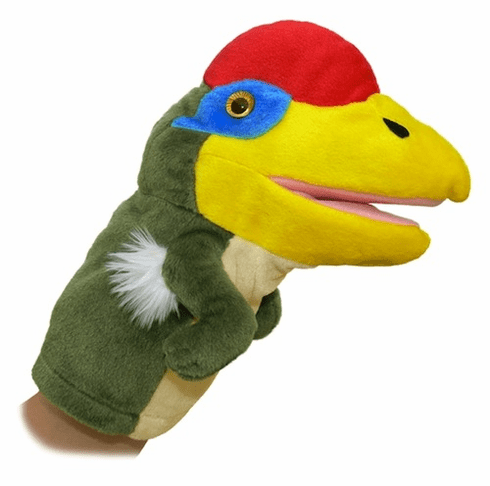 ÊOur plush oviraptor stage puppet will spark creativity, inspire interactive playtime, heck, this amazing plush oviraptor puppet is so cool that it might even keep young hands off of video game controllers from time to time! ÊMaybe. ÊAs with all of Aurora's amazing plush puppets, Opie the Plush Oviraptor Dinosaur is made from all new, child friendly materials and meets or exceeds all US safety standards. ÊSurface washing is suggested for our plush dinosaur puppet; recommended for ages 3 and up.